The original PIRATES OF THE CARIBBEAN: CURSE OF THE BLACK PEARL was a moderately enjoyable time waster that gave Johnny Depp a chance to shine doing his best Keith Richards impression as Captain Jack Sparrow. If things had stopped there, all would have been well. Unfortunately, PIRATES turned into a franchise, with each subsequent film becoming more bloated and stupid. It's been 6 years since the last tedious tentpole, ON STRANGER TIDES. With the major studios pretty much terrified of making anything that isn't a sequel, remake, reboot, or comic book adaptation, Disney has gone to the well one more time with PIRATES OF THE CARIBBEAN: DEAD MEN TELL NO TALES. It is every bit as dumb, cluttered, ugly, and obnoxious as the previous sequels. You want a plot synopsis? This thing is so confusing and inane and littered with pointless characters that I barely know where to begin. I guess all you need to know is that various characters, Depp's Jack Sparrow among them, are chasing after a magical object called the Trident of Poseidon that has the power to lift curses. 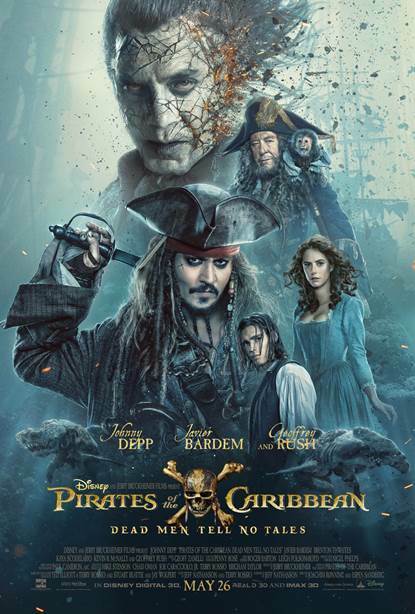 Javier Bardem is the big bad as leader of a bunch of vicious ghost pirates, and Geoffrey Rush is back as Barbossa, who also wants the trident. Rounding out the cast are Brenton Thwaites as Henry Turner, son of Orlando Bloom and Keira Knightley's characters from previous installments (they show up briefly, too), and astronomer/accused witch Carina (Kaya Scodelario). There are plenty of other characters cluttering this thing up, but I refuse to list them. This is just a terrible movie. Sure, it's technically sound and has a great cast, but it's just one mindless action scene after another, buried under an ocean's worth of CGI. Of course a sizeable portion of viewers are going to go see it regardless of what anyone says. Of course some of those people are going to convince themselves they enjoyed it. There's only so much one can do to help the delusional. All I can tell you is this movie is an utter crapfest, and while one hates to tempt fate, it's doubtful anything worse will come along this year. 1 out of 4 stars.